NOTE: SEE BELOW FOR MEMBER DISCOUNTED PRICE. (join ArCH now and reduce the cost (ArCH membership is only $159)). RESIDENTIAL SPECIFICATIONS for Architects. Recently updated. Buyers will be able to enter their ArCH discount coupon code in the Shopping Cart during the ordering process to reduce the cost (if they are an ArCH member). ArCHspec™ is a DWG file, opened inside AutoCad. Newly updated! Many of the latest best practices included, with URL links to electronic bid forms to help further control & simplify your bidding management, along with Divisions of specifications going through the project. THE ONLY ARCHITECTURAL RESIDENTIAL SPECIFICATION SYSTEM GEARED SPECIFICALLY FOR RESIDENTIAL ARCHITECTURE ON THE PLANET, CREATED BY ARCHITECTS FOR ARCHITECTS WHO DESIGN HOMES. ArCHspec™ is coordinated with the ArCH-AOA (Architect-Owner Agreement) and ArCH-OGCA (Owner-General Contractor Agreement) and the ArCH “4 in 1” (Bid Form, Value Engineering, Schedule of Values, and Pay Request Form). Never before has there been such an integrated suite of specifications and CA (Construction Administration) forms, to assist the production of CDs (Construction Documents), Bidding, and management of the entire process. 200. ArCHspec™ file is in AutoCAD-2013-2018LT (DWG). ArCHspec™ residential specifications is made to work inside AutoCAD2013-2018 LT on a 64 bit PC running Windows 7 -10 OS. About the only way to use ArCHspec™ on a Mac (Apple) computer is to have AutoCAD for the Mac (compatible version with ArCHspec™. SEE PARAGRAPH 3700 (below) for further instructions if you want to try on a Mac. See paragraph 3600 for other software and earlier AutoCAD versions. Otherwise, you must have a PC and software that your software provider guarantees will open the latest AutoCAD PC W7-W10 files without any problems (of compatible year/version with ArCHspec™). ArCH only stands behind PC AutoCad operated ArCHspec™. ArCHspec™ will not open in MS Word or any other program not specifically approved on this website page. (If you are an ArCH member and you do not know your ArCH coupon code, contact the email below). (Note: once paid, the ArCHspec™ file download may be zipped. Click on it to open. If it opens as a “Read-Only” file, simply SaveAs a slightly different name and there should be full functionality available. Contact: Contact ArCH if you have any issues. If your firm has an earlier version of AutoCAD (back to 2010) and still want ArCHspec™, send an email to the ArCH ContactUs form; we can SaveAs ArCHspec™ as an earlier version. However, some graphic functionality may or may not be lost depending on how old your version is. ArCH is not responsible for ArCHspec™ functionality in earlier versions of AutoCAD2013-2018 (although ArCH has tested back to AutoCAD2010 and it appeared viable). ArCH is not responsible for interoperability or transfer of data from ArCHspec™ to other software and formats different than AutoCAD2013-2018LT. Buyers are welcome to experiment with ArCHspec™ after purchasing, however no other operability than from within AutoCAD2013-2018LT is guaranteed (note: ArCHspec™ was first made available in AutoCAD2015LT, so ArCH knows that can work as well, but ArCH may need to “SaveAs” backward if your version of AutoCAD is before 2013-2018). See Paragraph 3700 below for instructions if you want to try ArCHspec™ on a Mac. See paragraph 3600 for other software and earlier AutoCAD versions. Note: PowerCADD for the Mac does Not work: it garbles the file. Some Apple software does not appear to allow a complete and problem-free file importation of AutoCAD (PC) files. ArCH does Not suggest you buy ArCHspec™ if you are using an Apple (Mac) computer with Apple OS CAD software, unless you have AutoCADLT for the Mac of a compatible version with ArCHspec™. ArCH will not be able to assist you if you try to use a Mac without AutoCADLT for the Mac as indicated above. ArCHspec™ is made to work inside of AutoCAD2013-2018LT for the PC with a 64 bit Windows 7/8/10 OS (Operating System). (Update: Don Duffy Architects in Charlotte, NC reports being able to open ArCHspec™ from inside ArchiCad (PC version 18) with full functionality). Update: Phillip Humphrey, AIA, with PGH Architecture in Wilmington, NC reported a slight degradation of formatting while importing the test ArCHspec™ abbreviated file into VectorWorks for the PC. Phillip said that he also opened up the ArCHspec™ test file in “Truview 2016” and he reported that ArCHspec™ appeared to import perfectly. Once again, ArCH cannot guarantee perfect migration into any computer system other than what ArCHspec™ was created within (AutoCADLT and full AutoCAD), but shares these reports to assist users in making informed decisions. This file is zipped, and it will likely open with a “Read Only” warning box. Just SaveAs another file title and it should have full functionality, if your computer system is completely compatible with the latest DWG files. This test file will also allow you to obtain an up-close and personal viewing of the ArCHspec™ general layout (just minus about 93% of its content). There are 4 files for downloading. 1. ArCHspec™ file, which is a DWG file. This is the main file. 2. & 3. Images1 file and Images 2 file. Each file has about a dozen JPG images. Those are provided, as the JPGs in ArCHspec™ typically will not survive the transfer to your computer. Buyers can reinsert those images where they should be placed, into ArCHspec™, if necessary. Use the ArCH ContactUs form if you need assistance with this. However, members have found that if you save these images files per the note below, they should install themselves. 3. Plotstyle table for ArCHspec™. Note: if you will make a copy of both the JPG image file and plotsyle table for each project you undertake and file those in the same folder as ArCHspec™ for each project, the images and the plotstyle table should automatically insert themselves and be available to you, when working with AutoCad. AutoCad “looks” for files near to it in the same folder before looking elsewhere. Otherwise, you will need to manually reinsert the images and plotstyle table (which isn’t very difficult), however, ArCH would prefer that you have a more automated workflow experience. Make sure you give us your SkypeName in your information and that you approve our subsequent request to contact you via Skype. UPDATE: this guided tour remains available, but has largely been replaced with paragraph 600 (above), which allows anyone to download an abbreviated ArCHspec™ file to see it on their own computer for themselves. • Faster residential specifications (editing takes less time). • ArCHspec™ was created specifically for RESIDENTIAL SPECIFICATIONS. 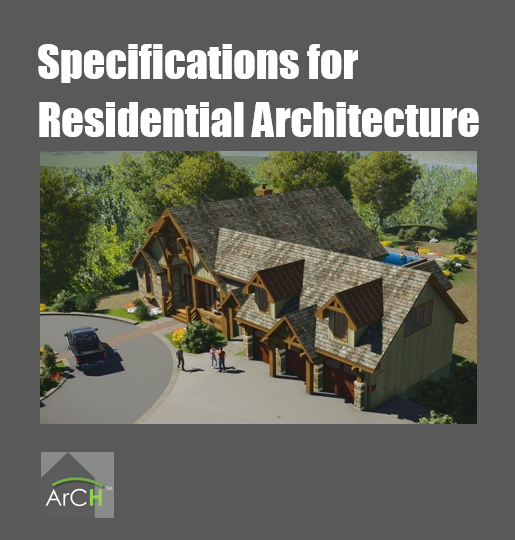 To ArCH’s knowledge, you can’t find residential specifications anywhere else (specifically created for residential projects and SFR). • Much less expensive than commercial, larger specifications from others. • Created by Licensed Architects who create homes for Licensed Architects who design homes. Green = (90-95%) is mainly on auto-pilot (once edited by your firm for your practice). Red = focused text that needs to be edited (within red rectangles). Focuses attention only on what needs to change for each project, saving dozens of hours for each project. Cyan = Code References included (IRC & IECC 2015) section number & page numbers. Yellow = Coordination section references to other specification sections. Gray = Educational Instructional Video link, typically to YouTube videos, illustrating how to properly install the product. White = Usually notes on thumbnail details within a given specification section. Nowhere else can you find this type if built-in AI (Artificial Intelligence) in specifications. • The only specifications created inside AutoCAD2013-2017LT, so users can edit specs while developing designs, in the same file. No complicated software: just use AutoCAD. • 50 years of “lessons-learned” by seasoned Architects & Licensed Home Inspectors built-in. Contains many sections generated from decades of specification writing and residential architectural & inspection experience by Licensed Architects & Licensed Home Inspectors who are sharing their experience right there in the specifications, with custom-written sections created to help you,your Clients & Contractors to avoid problems that others have encountered over the millennia. • Clear simple writing, non-redundant (unlike some other spec formats). • No bulky Part1, Part2, Part3 formats that inflate specs like those from other sources. • Bid forms included (and completely editable), linked to smart spreadsheet files included at no additional cost. • Numbered spec paragraphs included. • Numbered Drawing Notes (ArCHnotes™) keyed back to specs included. • Energy Value section included. (directly related to IECC requirements). • Structural Loads section included. (mainly from IRC tables). • Thumbnail “cameo” graphic details included (an industry first): actual small details alongside various spec sections, graphically explaining what the text describes, which can help eliminate some detailing, saving dozens of hours of time, while better communicating intentions. These include several metal roofing details, concrete slab joints, many flashing details for complex conditions, some electrical and many others. • Buyers are licensed to use it forever for the original purchase price. No costly subscriptions. • Links to some manufacturer installation videos included. More will be added in the future. • Classic, easy to remember traditional CSI format: 1-16, plus 0 and 17. • 145+ current specification sections now part of the file and growing, with each release. • Continues to be updated by Licensed Architects who design homes. • First 3 months of updates included at no additional charge, whenever you request them (limit: one update per month). • During first 3 years, updates after 3 months available at discounted pricing. Check for pricing when you want an update. 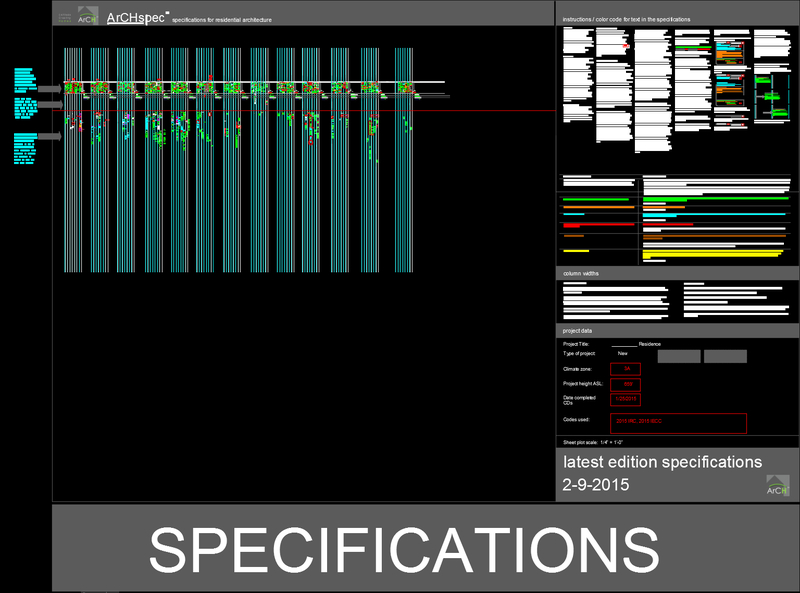 • After first 3 years, future purchase of latest ArCHspec™ version available at discounted rate. Note: support is only available for buyers’ use of ArCHspec™ inside of AutoCAD2013-2017LT. ArCH can help explain how to edit, move and create specification sections, details, and how to use the ArCHnotes™ features. ArCH cannot provide any assistance in any attempts to use ArCHspec™ in other software or in any attempts to migrate into other software. Buyers may also use this Contact ArCH link NOW to ask any questions about ArCHspec™ before you buy. “Build your firm’s residential design intentions better. Anything that results in the creation of better residential design & construction, along with helping residential Architects and their Clients is what ArCH is about. To this end: ArCHspec™ is intended to help Architects create better documentation of the homes they design, by specifying the various aspects of the materials, procedures and other elements of the residential design, detailing, specifying, bidding & construction process. Ownership/ use: once firms (and individual Architects) purchase ArCHspec™ architectural residential specifications, they are licensed to use it as many times as they wish; modify it however desired, copy, move, edit and paste it however wanted, for as long as they like. Simple. Easy. Flexible. When buying ArCHspec™ architectural residential specifications, users will not have to pay for a forever subscription. Your firm/individuals can use it forever. But if you would like updated content (recommended), for the first 3 years after buying, users will be able to purchase updates for a discounted price (within 1 year: 25% of latest price, within 2 years: 45% of latest price, within 3 years: 65% of latest price) . After 3 years, if the latest updated version is desired, users will need to buy it again, however, for a discounted price (75% of latest price), as a previous buyer. If compared with other specification systems (some of which are sold by the individual section for well over a hundred dollars/section from other sources) buyers will start to understand what a bargain ArCHspec™ is. And it is tailored to a more compact custom architectural project approach. Specifications geared to how licensed Architects design houses: Architectural Residential Specifications. Who better to create them than those professionals who mainly design homes? Licensed Architects. These are architectural residential project specifications, written from the viewpoint of Licensed Architects designing custom SFR (Single Family Residence) projects. Are there more expensive, voluminous commercial project specifications for hospitals, museums, industrial complexes and high-rise buildings elsewhere? Yes. And Architects are welcome to use those, if the project types being designed can tolerate having hundreds or thousands of pages of specifications. However, if you’d like to be able to manage your residential project specs in about 4 to 14 drawing sheets of specs, ArCHspec™ is for you. Note: some of the experienced people helping to craft ArCHspec™ are also Licensed Home Inspectors. These people understand all the bad things that chronically are built into houses. Their lessons learned built into ArCHspec™ help make sure that these deficiencies that are in most homes won’t be in those you create. 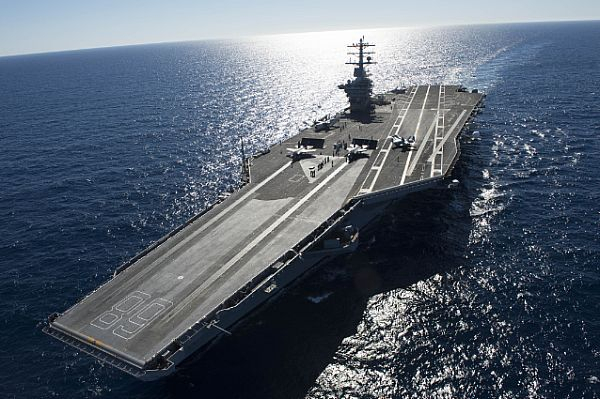 Writing specifications for projects in the past has felt like you were piloting an Aircraft Carrier: big, clumsy, time-consuming and not very nimble. That changed with ArCHspec™: quick, concise, easy to edit. And in one of most popular native design environments: AutoCAD. More like driving a Ferrari: lighter, faster, focused, quick and easy. Paragraphs are numbered, for easy coordination with Working Drawings. The architectural residential specification sections are smaller and grouped into bite-sized sections for easy understanding of what is involved in each section. Most of the paragraphs are separate chunks of text, allowing users to conveniently move them around on the Specification Sheets, as users edit the specs for each project. Some other specification sources try to be all things to all people and all architecture & engineering. That’s well and good, if you are designing convention centers, high-rises or other large commercial facilities. However, if you are designing homes, that’s probably not going to work very well for you, and you are going to have to do a lot of work to convert those types of “big” specs to fit into a residential project. Courtesy Ferrari S.p. A. Being the best doesn’t mean being bigger. That’s why ArCH created ArCHspec™: MADE primarily for SFR (Single Family Residential) architectural design work. More condensed. Tighter. Simpler. And much more effective at doing what needs to be accomplished when designing a home. Sections are custom-created with decades of years of lessons learned about SFR projects in the text and also in many graphic illustrations. ArCH doesn’t try to be all things to all Architects. ArCH: Architects Creating Homes; that’s what ArCH is about, so that ArCH can help you, as an ArCH member, to be better at what you do. Any Architect can recognize the sinking feeling when they realize that they have a problem. It’s hard to not ever have one or more of these as Architects designing complex projects, and especially when designing homes (which are, by nature complex). The question is, what do Architects do to make sure those problems aren’t ever repeated? Sure, some of those lessons learned can go into your contract(s) (see AOA for those here), but many of these “school of hard-knocks” lessons learned really should be going into an Architect’s specifications…so they will never have those problems ever again. There are dozens of these lessons learned; hundreds, literally, built into ArCHspec™. 50 years worth. Why? So that hopefully users of ArCHspec™ won’t have to experience them. 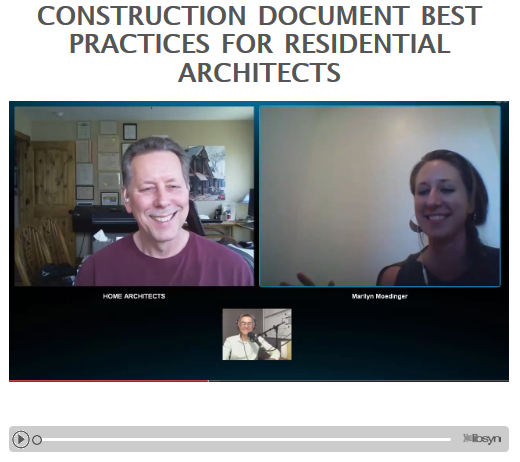 One of the ways ArCH Improves Residential Architecture is by helping its members avoid problems, while helping them create properly documented architecture. Nothing can entirely eliminate problems, or guarantee that, but by having projects documented more thoroughly, that helps minimize them. Can you go to manufacturer websites and copy and paste their information into specs instead of using any sort of specification system? Sure, however, how many products are going to require copying and pasting? Hundreds for each project? And in what format (they are all different, depending on the manufacturer)? And what information should there be the specifications that the manufacturers left out? For instance: try finding the weight of asphaltic impregnated fiberglass roof shingles today on manufacturer’s websites. It isn’t there. Several years ago, manufacturers systematically removed that information. However, ArCHspec™ knows what the minimum should be and has that information. And there are many more examples: things about which some Architects may not be aware: like the best underlayment to use under 90% of most roofing (ArCHspec™ includes that information), and how draining gutters and downspouts should be connected to onsite subterranean piping (those pointers won’t likely be on any manufacturer’s website: an Architect has to either know about it and have it in their specs or this can be easily overlooked). In other words, ArCHspec™ helps keeps Architects of homes pointed in the right direction, and COORDINATES specification sections together. Trying to build an entire specification, one separate manufacturer’s section at a time, doesn’t provide a comprehensive coordination between sections. 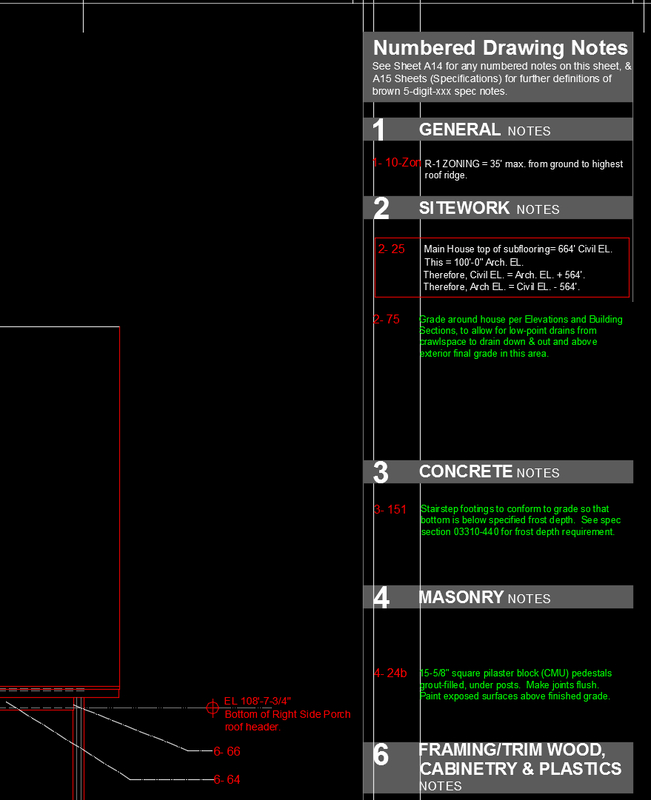 ArCHspec™ comes with its paragraphs pre-numbered and coordinated with other numbered sections throughout the entire specification (and with the other forms in ArCHsuite™), for convenient use in ArCHnotes™ and on your actual drawings. Manufacturers can provide good information for new systems or updated products that each project is using, however, that’s kind of like a bucket of bolts: each bolt in the bucket is useful, but that bucket of bolts does not equal an automobile. To make a vehicle takes a lot more planning, intelligence, experience, preparation and coordination. Same thing with a specification system: it takes person-years of coordination to pull it together as a comprehensive system. And manufacturers’ specifications typically don’t cross-reference national IRC code sections. Therefore: manufacturers’ website information is useful to flesh out and update an existing specification system, but they don’t take the place of that system itself. Many national & regional professional service purchasing organizations recognize housing as one of the most (if not the most) detailed and complex types of architecture on the planet. There is more going on per Square Foot (SF) than in any other type of building. “I’ve designed and planned NASA laboratories, High schools, Middle Schools, Elementary Schools, University Buildings, Solar Research Facilities, Restaurants, Parking Garages, High-rises, Condominiums, World Class Theme Parks (Universal Studios), Industrial Facilities, Military Projects, Airports, Hospitals (ICU, Triage, NICN, Operatories, etc. ), and I’ve never found that anything approaches the complexity that you can find in a Single Family Residence on a per square foot basis. Particularly in a Kitchen, Bathroom, Fireplace, Window Wall, Deck and Stair areas,” said Rand Soellner, ArCH, NCARB, MA Arch, Senior Architect of HOME ARCHITECTS ®. “The closest might be the isolette groupings in a Neonatal Intensive Care Nursery in a major regional hospital (which I have designed), or the Patient Headwall apparatus in an ICU. However, those pieces of equipment come already configured from the manufacturer and all the Architect needs to do is locate them, then have the Engineers provide connections. In a residential custom kitchen, the Architect has a lot more work to do in the same amount of space.” Most State governmental organizations also recognize residential projects as among the most complex, as does the AIA, ArCH, the Federal Government of the USA and Canada. The point being: Don’t think that it’s just a house. It IS a house and that’s a very significant project type. There are many things to coordinate, detail and specify. No one, particularly an Architect, should ever be cavalier about creating a home for someone. Rest assured that homeowners take it very seriously. There are lawsuits that occur across the USA due to problems with the design and construction of homes. Specifications are one of the strongest tools an Architect can have at his/her side to help the Contractor build a better project and insure that homeowners are pleased with the results. And targeted Residential Specifications make that job so much easier. Just one example: What if an Architect created a project without specifications and didn’t mention that all exterior exposed structural wood has to be pressure-treated? Any ideas as to what could and probably will happen? Exterior joists and beams could rot and fall, possibly hitting someone, injuring or killing them. No Architect would want to be responsible for that. And the legal consequences could be very unpleasant. And if anyone believes that putting the classic “build per Code” note on the documents will prevent this, think again. Various Boards of Architecture across the USA require Architects to provide more detailed requirements than this. Architects are expected to provide expert guidance that help promote the Health, Safety & Welfare of the public (i.e. : clients that hire Architects to design their homes). And having specifications is one of the simplest and surest ways to help achieve that goal and satisfy those requirements. And what about residential elevators? Swimming pools? Concrete mixes for freezing climates? Who is responsible for what if the Owner buys the appliances? The tile? The wood flooring? And what about plumbing supply preferences? On and on. Many residential Architects don’t use specifications. That is dangerous: for the Architect, their company’s liability, for the Client and the Contractor. Not having specifications can result in liberties taken by Contractors, material suppliers, subcontractors, laborers and others to save money that result in problems like rot, unhealthy conditions, structural collapse, injuries, death, accelerated wear, lack of energy efficiency and other situations that Architects should not allow or want on their projects. Specifications can help save Architects and their Clients the heartaches of problems that can and will occur without them. Using ArCHspec™ can help Architects reduce project liabilities and improve the quality of the built project, when used in accordance with instructions and architectural best practices. ArCH understands why some Architects may not have been using specifications up until now on residential projects: too large, hard to work with, expensive, take too long to edit, ignored because they were in a separate book, so why bother. Understood. That is why ArCHspec™ was created: to fill that void: not too large, not too small; just right. Enough detail where it is necessary, brief where brevity will suffice. Easy to edit. Faster to edit. Customized for how residential Architects work. And right in the AutoCAD drawing modelspace file for easy reference while Architects work on the drawings. A simpler, direct approach for electronic specifications, more integrated with electronic drawings than ever before. If you’re the kind of Architect that believes any specification longer than 1 sheet is more than you need, then ArCHspec™ isn’t for you. However, if you’re the sort of Architect that Does want to have specifications, but that feels that having a 2,000 page bible with hundreds of pages of redundant language is too much, then ArCHspec™ may be just right for you. IMPORTANT NOTE: YOU CAN EDIT ArCHspec™ TO BE AS LONG OR AS SHORT AS YOU WANT. That bears repeating: YOU CAN COMPLETELY EDIT ArCHspec™ to be whatever you want it to be. Presently, it comes with about (17) 24″x 36″ sheets of 10 point text on them, giving users fairly reasonable specifications for a quality custom house of about 6,000 HSF (Heated Square Feet) with about 8,500 GSF (Gross Square Feet), 2-story wood frame with masonry or concrete foundation walls, renovations & additions (or completely new construction), basement, including a 3 car garage, crawlspace, upgraded exterior paving treatments, in-ground custom swimming pool, residential elevator, typical utilities, including septic, well, exterior piping, service entrances and much more. So: if a project doesn’t have a swimming pool, garage, elevator, or other items that come with ArCHspec™, users erase those for projects that don’t need them. It’s mainly a process of elimination, which is far easier than adding. And much FASTER. However, because ArCHspec™ comes in AutoCAD, you certainly can add whatever you want. One of the Architects using ArCHspec™ recently edited it down to about 4-1/2 sheets (24×36) of specifications for an upscale kitchen renovation project with a separate laundry, bar, pantry, corridors, structural revisions and related utilities. It was fairly detailed. So: if certain users feel that more than just one sheet of specifications is too much for small projects, then perhaps it’s not for them. But then, neither is a multiple- thousand-page specification system (as are most other specification systems, which are intended more for large commercial projects). ArCHspec™ has tried to strike a balance, erring on the side of compaction, to provide an option for architectural firms struggling to provide specifications for custom home projects, where they want quality, yet not a Bible. ArCHspec™ does that. Specifications do not necessarily make any more work for responsible licensed Contractors. 1. Specifications provide information that defines WHAT the products and grades of materials ARE. 2. In some cases, specifications indicate HOW the products are to be installed in a durable manner. 3. Specs also indicate WHO the manufacturers are. 4. Specs may describe WHERE the items are located in the project. These are all questions that have to be answered during the project anyway. Providing them for the Contractor’s convenience should be appreciated by good Builders who intend on using reasonable quality materials (at least mid-grade in terms of longevity) and installing them in a manner that results in air and water tightness. Any Builder that appears to have a problem with the fact that Architects are providing specifications, might be an indication that he/she intends to use lower grade materials and products and install them in a less than quality manner that may result in a cheaper (literally) way that results in premature rot, insect infestation, air intrusion, leaking, mold growth and other situations that have negative consequences. We have actually heard of only one less-than scrupulous Contractor complain about having specifications included in the set of Construction Documents. He said: “I don’t want to do things your way (the way of a Licensed Architect). I want to use the materials I want to use and put them together any way I want, without you telling me what I can or can’t do. I don’t want anyone watching what I’m doing.” Does that sound like the sort of Builder anyone wants to use? Such a builder might initially offer a somewhat cheaper price, but what sort of result occurs? Beware the Builder (particularly unlicensed ones) that object to seeing specifications. All specs do is indicate your materials, their quality (which doesn’t have to be top-end, but at least mid-grade) and recognized manufacturers so that you don’t end up with substandard work on projects. No responsible Contractor should object to that. ArCHspec™ specifications come with bid forms. This allows Architects and their Clients to directly compare the “apples to apples” prices of one GC (General Contractor) to another. In other words, having specifications (and standardized common bid forms) can help you find better Builders, compare their prices fairly to others, all of whom are on a level playing field, and all of whom will hopefully construct a better house, based on the same residential specifications. This is a new feature to ArCHspec™, but it is expected to grow over time. This is the gray text discussed above in par. 900 under COLOR CODING. When you see the little video screen symbol and gray text inside a gray rectangle, that means that there is a URL there. Users can copy and paste this URL into MS Word (press Enter to activate the URL link at the end of the URL), then click on the URL, which will call up a manufacturer’s instructional video about installing the particular products/ materials. Talk about interactive specs! Nowhere else has this been done, to ArCH’s knowledge. Now, you can easily find video instructions for your project products for the Contractor and his installation crew to watch before they install the products into your projects. This is an amazing feature to have in your specifications that is sure to help construction personnel understand what to do to properly install materials and systems on your next design. ArCH prizes the capabilities of Licensed General Contractors. They build Licensed Architects’ designs. Where would Architects be without those Contractors? Some of ArCH’s own members ARE both Licensed Architects AND Licensed General Contractors. By merging the strengths and skills of these 3 parties, the project can be a success. What is interesting about specifications (of any project type): they list the Owners’ and Architects’ (and Engineers’) requirements for functional needs and quality, and what and how the Contractor is to achieve those goals. In other words, the specifications perform the function of COORDINATING all parties, in a written format, as part of the Contract Documents, to help avoid misunderstandings later. Without the specs, misunderstandings would most certainly happen, and do, on projects not having specifications. Having a trouble-free project should be the goal of the main 3 parties (Owner, Architect, Contractor) and others. Specifications pre-coordinate everyone. Therefore, all parties involved with the project should appreciate the specifications. Particularly residential specifications. Green = ready for use, probably rarely need to adjust. Red = warning! Stop! Edit this. Orange = Caution: may be alright, but should be reviewed. Yellow = Coordinated section or other related item. Brown = Numbered SpecNote™ that alerts you & Contractor to this spec section (linking the note on your Drawings to this section in the Specifications). That’s how ArCHspec™ is arranged and coded. Most of these color codes are AutoCAD “index” colors, which means that they print in black & white, not the index color. The index colors are merely used as a convenience for users, so that they can see what the TYPE of text is that is being viewed. Unlike the normal text you find in other specification systems (dumb: black & white). One of the exceptions is the SpecNote™ brown number, which will print in dark brown in color and bold gray dithered in b&w. The Licensed Architect should review every word when they first start using ArCHspec™ and make sure that it is arranged in the way they design and manage their projects, typically. However, once reviewed and verified, ArCHspec™ residential specifications has been created so that 90 to 95% of it should be on “auto-pilot” and the remainder is what needs editing for each project. Sure, when codes update and when Architects modify their practice, they need to update their specifications. Same thing for unusual projects and unusual systems and different materials than are normally specified by a given firm. However, the ease of use factor with ArCHspec™ is unprecedented in terms of what is needed to be changed and what can be accepted as typical “boiler plate.” ArCHspec™ comes with what is anticipated as mainly Green (“ready for use”) text, with the red and orange text being what will typically need editing for each project (however, you will need to adjust for your own practice). Great idea! Why haven’t specifications for ALL projects been arranged this way, from the beginning? Time-tested on scores of SFR (Single Family Residential) projects (and actually, on commercial projects as well, over the years). However, the current version is tightly, specially focused on SFR projects, with the Architect of the project preparing the entire set of specifications. It is recommended that Architects have any other professionals involved in the project, review Sections related to their work, after the Architect’s initial first pass edit. The Architect Of Record is ultimately responsible for what they publish, so review and edit with care. Each professional should sign & seal sections involved with their practice and licensing regulations. There are scores of lessons-learned built into ArCHspec™. For instance, “Z” flashings (both in specification text and in a “thumbnail” detail right there in the specifications). Without this, you could be risking severe water intrusion into your projects, resulting in rot, lawsuits, unhappy clients and other problems. Also, makeup air at kitchen exhaust hoods over 400 CFM. It’s in the Code, but hard to find! ArCHspec™ has that covered, along with dozens of other important issues many of which are not even in the Code, but are simply wise things to do to insure that Architects’ projects are more watertight, airtight, healthy and durable. Architects should add their own “failsafe”‘ sections that are oriented to their business. ArCHspec™ is completely editable and customizable by all user Architects. ArCHspec™ (with each Architect’s input) is part of a firm’s SAFETY NET and part of the QA (Quality Assurance)/QC (Quality Control) list, that, in association with the drawings, elevates document standards to a higher level. If the Architect checks the drawings while editing the specs, the level of QA/QC just improved many-fold. Focused attention only on what changes for each new project = less time spent on specifications. Most critical custom data entry locations are coded red, within red rectangles (prints in black) so that users can easily find what needs to change for each project and leave the boilerplate on autopilot (once the Architect has checked each section for a firm’s practice needs). This laser-like focus on what needs to change and what doesn’t saves users dozens of hours and helps Architects produce better residential specifications, because they are less likely to omit something that has to be adjusted for each project, when there’s a red rectangle around it and the text that needs changing is in red. 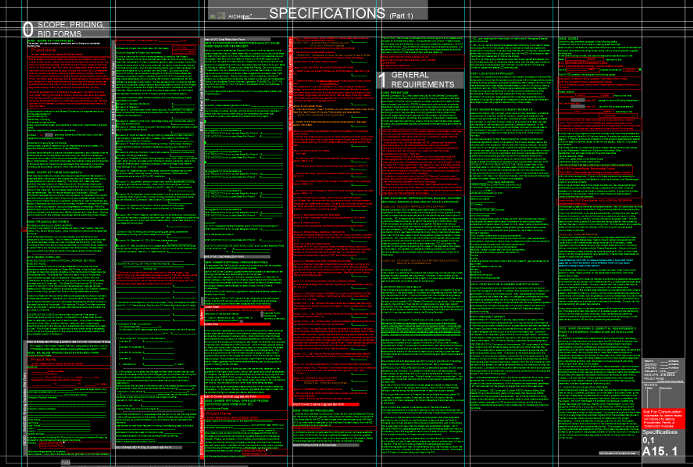 Actual screen capture of one of the ArCHspec sections, illustrating how most of the text is on “auto-pilot” (in green), with the focus on the red text inside the red rectangles being what should be edited for each project. (C)Copyright, 2014, ArCH: Architects Creating Homes, LLC, All Rights Reserved Worldwide. 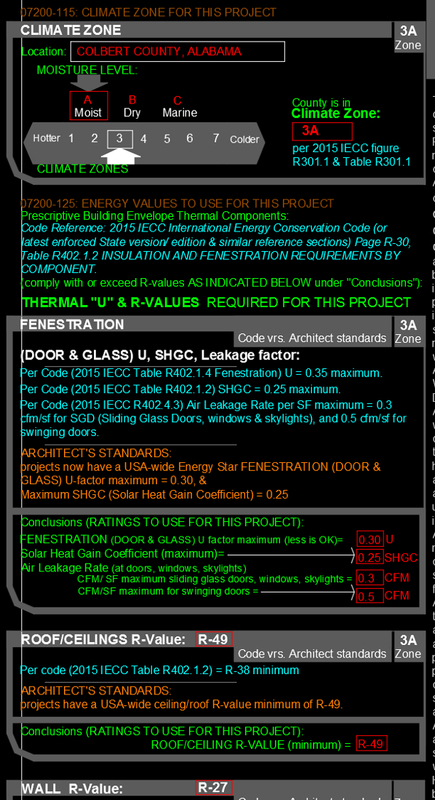 Code references to 2015 IRC (International Residential Code) and IECC (International Energy Conservation Code), including Section numbers and page numbers for easy checking. Code References are in Cyan, so that users can easily find these across the entire specification, which makes editing and updating so much easier, when new codes are published. This research is already done for users. Note: Architects should cross reference to the State of the project’s amended version of the references code sections (which are often more lenient than the national codes cited). Actual screen capture of an ArCHspec section. The Cyan (may also be light blue) is the Code Reference, indicating the Code book, Referenced section and page number, for easy checking and updating in the future. (C)Copyright, 2014, ArCH: Architects Creating Homes, LLC, All Rights Reserved Worldwide. Extremely effective data entry sections formatted to allow Architects to easily find and declare Climate Zone, Moisture Level, U & R values in Division 7. There’s never been such a well thought-out thermal/energy specification for homes (see below). This ArCHspec™ section allows users to declare what Code requires, then indicate what your office standards are (which quite often may exceed Code), then declare what will be used for this project (Conclusions). In this manner, users don’t have to worry that someone working on projects will come at the Architect saying things like: “but Code doesn’t say that…” This section allows the Architect to declare what Code says, and what the architectural firm is making a requirement for this project, and the Architect is stating intentions to go beyond Code. This puts out administrative “fires” before they begin. Actual screen capture of part of the ArCHspec energy section, illustrating how to select a project’s Climate Zone, and U, R and other energy values. Note how 3 elements are referenced: CODE values, YOUR firm’s preferred values, and CONCLUSION values to use for this project. (C)Copyright, 2014, ArCH: Architects Creating Homes, LLC, All Rights Reserved Worldwide. 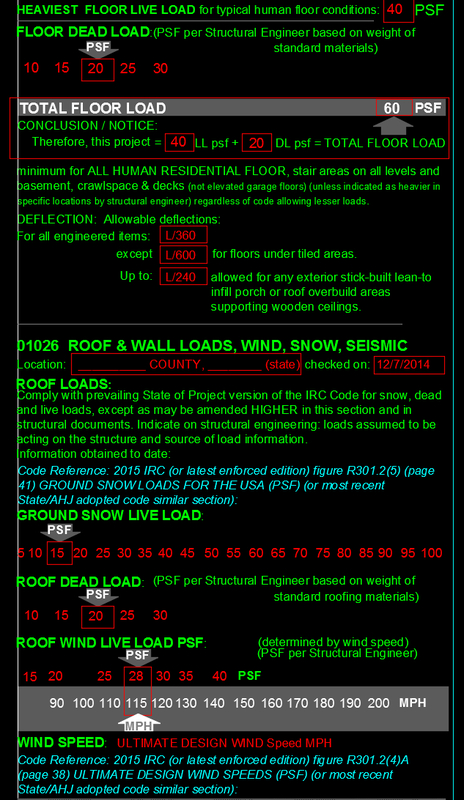 Per IRC, ArCHspec™ allows users to declare normal residential loads for wind, walls, roof and floor. Focused section data entry areas speeds this information, making it a snap. Note: Architects should always consult the project Structural Engineer to verify these edits and structural values. Never before have residential specifications been so thorough and effective. Actual screen capture of a portion of the ArCHspec Load section in Division 1. Note how this section allows users to slide the PSF and red rectangles right or left to pick the PSF values for their project, and how the Code References help Architects to find the relevant code book, code section and page number from which to easily find these values. (C)Copyright, 2014, ArCH: Architects Creating Homes, LLC, All Rights Reserved Worldwide. Contractor Bid Forms built into spec Section 0. Now projects can be bid “apples to apples” instead of “apples versus oranges.” Tired of Contractors bidding projects using their own letterhead or their own invented forms? That makes it just about impossible to compare one Builder’s bid with another. With ArCHspec™, that can be a thing of the past. Screen capture of the start of the Bid Form portion in Division 0 of ArCHspec. Note how you, as the Architect, mainly need to focus only on what’s in red, for each new project (the Contractor needs to fill out the entire form). This will bring order to the former chaos involved with bidding your projects. (C)Copyright, 2014, ArCH: Architects Creating Homes, LLC, All Rights Reserved Worldwide. What you are seeing above is only a small portion of the entire traditional analog Bid Form, which is included in Division 0 (now below the main sheet). UPDATE: This has now been replaced on the main sheet with an electronic link to a highly automated spreadsheet (the ArCH 4 in 1 form) that now comes with ArCHspec™ (as a free bonus), which functions as: Bid form, Schedule of Values, Value Engineering form, and Pay Request form. This starts your project out on the right track and maintains that through the entire Bidding and Construction Administration portion of your project. Amazing! Now your bids can be totally electronic, categorized into all of the line items that major banks, Contractors and other recognize as being necessary. And this helps you and your Clients to better understand the pricing of the various Bidding Contractors, allowing you to compare line item “apples to apples.” And, the ArCH 4 in 1 form is organized, coordinated and mated to ArCHspec™. The 4 in 1 bid form uses the same categories that are in ArCHspec™. Never before has residential architectural documents been so well married to the actual Bid Form, which starts the entire construction cycle of activity, marrying what the Contractor proposes from Day 1 throughout the job. Coordination Plus! 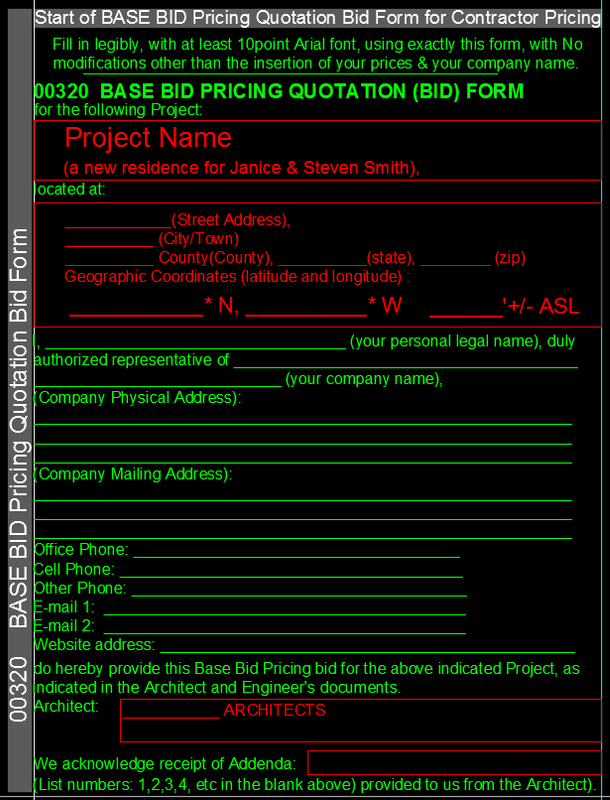 There are also forms included that request the Contractor to indicate up to 5 deduct options of his own making (rather than having these coming at Architects later), and Architects can include their own Owner Optional Upgrade list of bid alternates, which can be very effective in helping Clients control construction costs on Bid Day. Not many Architects presently do this, but should! They could save themselves and their Client a lot of grief when the project comes in over budget. Buy ArCHspec™ and see how. Divisions 0-17 (using the time-honored CSI specification Division numbers). It has been the experience of many residential Architects that the current 50+ CSI specification Divisions cannot be readily remembered by architectural staff, much less in-the field Contractors, Sub-Contractors, material providers, and especially by craftsmen and laborers on the jobsite. Therefore, ArCHspec™ was developed in accordance with the historically well-known Divisions 1-16, plus a Division 17 (Low Voltage Systems) and Division 0 (Project Scope, Bid Forms). Contractors report an easier familiarity with numbered notes belonging to these Divisions from cost estimators through carpenters and others involved with the day-to-day construction of SFR projects. 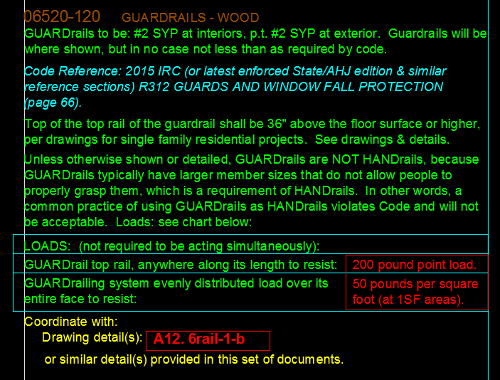 CLICK ON THIS IMAGE to see a PDF of a partial sheet of specifications. When the PDF comes up, just click on the “+” repeatedly, to enlarge until you can see clearly, then move the horizontal and vertical bars to look around the sheet. OR: you can also grab the edge of the PDF viewer and expand the window to be larger, then select “Fit Window” for the image to expand even more. Keep in mind that this is a Screen Capture from an actual AutoCAD session: what you see in a PDF will never be as bright and as full of contrast as your actual computer monitor display. However, you will be able to read and see several interesting specification sections, some “thumbnail” details, the start of the Energy Section and ArCH’s own ArCHomesData energy posting form. (C)Copyright, 2014, ArCH: Architects Creating Homes, LLC, All Rights Reserved Worldwide. It is difficult for ArCH to provide a preview of the entire ArCHspec™, because there is a lot to show. There are many screen captures illustrated on this product page. In particular, click on the one above: set the PDF viewer to “FIT TO PAGE” and then rubber-band the corner of your PDF wide and tall to fill your monitor. That is a reasonable representation of what ArCHspec™ looks like in use. UPDATE: There is now a test abbreviated ArCHspec™ file that you can import to see if it works on your system. See paragraph 600 above. UPDATE: ArCH was just interviewed online on the Entrepreneur Architect channel, with complete video, audio and moving screen demonstrations. Look for that link to appear soon (above near the top of this page). There have been decades devoted to crafting these specifications to use with SFR (Single Family Residential) projects and once buyers see the entire specification system, they will begin to understand how effective these can be for future projects. (C)Copyright, 2014, ArCH: Architects Creating Homes, LLC, All Rights Reserved Worldwide. Architects of SFR projects have built into these residential specifications their lessons learned on real projects with over 33 years of licensed experience. The specifications have many of these built-in: “I wish I knew that before this project started! I’ll put that into my specs so that won’t happen next time!” You can’t beat the knowledge that comes with over three decades of experience, designing, detailing, specifying and administering construction on scores of projects and the hard knock solutions that such experience brings with it. Those are already in these architectural residential specifications. These specifications are not written by administrative people. They are written by actual Licensed Architects who design custom homes for a living, day-in and day-out, over decades. It incorporates their lessons learned over a lifetime of detailed experience. Note: ArCHspec™ also includes lessons learned from Licensed Home Inspectors, who understand the deficiencies built into most homes through lack of knowledge or concern of the best ways to design, specify and construct materials, systems and features. The detailed input (right from home inspection checklists) built into ArCHspec™ make it a stronger system than any other made specifically for residential projects. There are a lot of opinions and discussion as to the proper way to design and provide Air Barriers in your SFR projects. 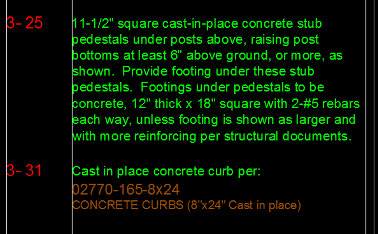 ArCHspec™ has this vital information included and on autopilot for you. Don’t get caught with your documents not managing this important new Energy Code issue. There are compact mini-details created by Licensed Architects with decades of experience directly adjacent to and part of some of the Sections. These illustrate, right next to the text of the specifications, what the words mean, in terms of location, materials, assembly and in some cases, dimensions. Since the specification sections have unique CSI-related (similar to Construction Specification Institute) numbers, these details can be referenced on the Drawings, using the spec paragraph numbers, just like an Architect would reference any other detail in a project. 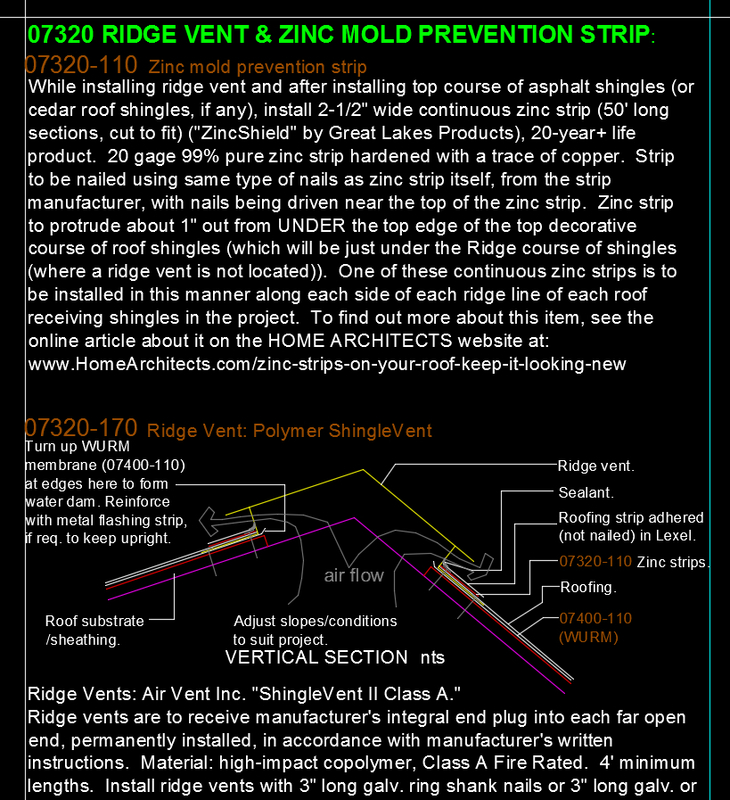 Actual screen capture of ArCHspec section involving Division 7 Ridge Vent. Note how effectively ArCH’s “thumbnail” details help to explain the text of the specification. And, the thumbnails can be edited to suit each firm’s preferences. Although, many may find the capable arrangements suited to best practices. And also note specialized knowledge throughout the ArCHspec about such items as the zinc mold prevention strip, which is not commonly known, but which is economical and effective at inhibiting mold growth on Client roofs. Using ArCHspec can be a learning experience for many Architects, gaining outstanding information that will help improve projects. (C)Copyright, 2014, ArCH: Architects Creating Homes, LLC, All Rights Reserved Worldwide. (C) Copyright 2014, ArCH: Architects Creating Homes, LLC, All Rights Reserved Worldwide. Sample Section with ArCHspec unique Thumbnail Detail. This is a breakthrough in specifications! Why? Because the Architect can now take these numbers (literally copy them in AutoCAD) and paste them ANYWHERE in your project documents, including the DRAWINGS, to point at appropriate items, explicitly defining what they are! Ever had a Contractor say he didn’t include in his bid price something that was shown in the drawings, but was not identified (like a ridge vent)? Did the Contractor say something like: “Oh, I thought those were just some lines. I didn’t put anything in my price for that. That’ll be extra.” Then, the Architect has to go to their Client and explain this to him/her and then have the Client say : “If you failed to identify it, YOU pay for it. You obviously didn’t do a very good job with your drawings and specifications, for which I paid you a lot of money!” Then the Architect wonders how they are going to pay for such things and why, and wonder if they should object and risk alienating their Client and facing possible legal action, and the cost of having to pay an Attorney $350+/hour for representation. How to avoid such problems: BUY ArCHspec™ and use it. All paragraphs have numbers and brief text descriptions, so that Architects can either choose to use just the number on very busy drawings, or the combination number and brief text descriptor, where there is space, to help the Contractor (and his various Sub-Contractors & material suppliers) know what those features are that are on the drawings (and WHERE TO FIND THEM IN THE SPECS). Never be faced with a situation like the above scenario. Always be precise. ArCHspec™ can help. In the ArCHspec™ version that is presently available, it also includes ArCHnotes™, that helps Architects bridge between specifications, project numbered notes and drawings. This is a cohesive system that fully integrates specifications & drawings! Why hasn’t anyone else ever done this before? Because it has taken decades to accomplish, tested day-in and day-out, year after year, on real-world projects. Not easy to do, across the entire spectrum of specification sections and to do so consistently. Once started using ArCHnotes™ in coordination with ArCHspec™, Architects will wonder how they ever produced Construction Documents without them. And they might also wonder how they have avoided problems all these years (or perhaps they haven’t avoided those). But now, a better way has evolved: ArCHspec™. 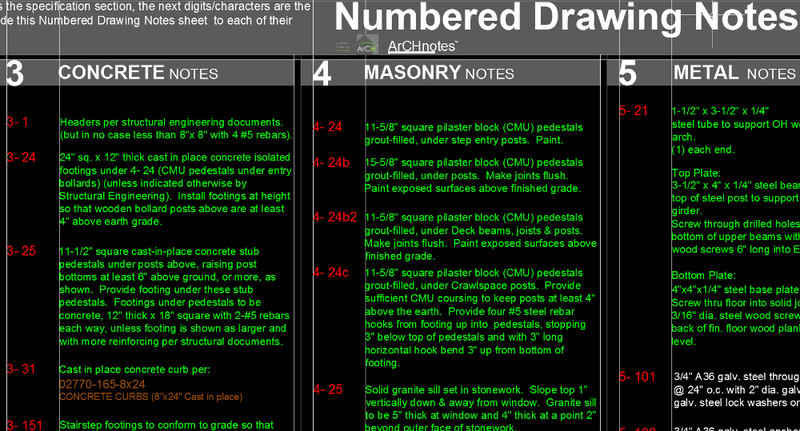 Time to integrate project numbered notes with drawings & specifications. You will need to have a description in your front end documents of your project, informing the Contractor that the documents are now using a numbered note system and how it works. There may be some Builders (not all) that want to have a lack of specificity in the documents so that they can make substitutions. This could result in problems. And the Architect could be blamed. Stop being a scapegoat. Be specific. Get ArCHspec™. Note: quality Contractors should never object to having more detail and specificity. Good Builders don’t want problems and should desire a positive relationship with both the Client and the Architect and look forward to years of positive professional association, where all parties can help each other solve problems and prevent them. Beware of Builders that object to documents being more accurate, precise and better defined. Some Architects feel that they don’t have time to define everything on their drawings. Are their project documents good enough to survive a professional conduct review by a State BOA (Board of Architecture)? And can they withstand scrutiny in legal situations? Be prepared: always do a good job. ArCHspec™ can help. Would any gainfully employed practicing Architect want to try to create their own custom residential specification system from scratch? How much is an Architect’s time worth an hour? $75? $100? $150? $200+? Let’s divide that into the asking price for ArCHspec™ : (currently $1,700 for ArCH member (verify latest price above))= at $75/hour, that would = 22.6 hours. At $200/hour, that = 8.5 hours. Would anyone think that they could reproduce something as detailed and as comprehensive as ArCHspec™ within 8.5 to 22.6 hours? There are more than 40 years worth of effort into ArCHspec™ to date. Estimated current amount of person-hours spent creating ArCHspec™: approximately 6,000+ hours spent over the years. At $125/hour = $750,000 worth of Licensed Architect time spent creating ArCHspec™. Comparing this with other specification systems (some of which are sold by the individual section for well over a hundred dollars/section) the ArCHspec™ residential specification system is a bargain. Let’s do the math: Other system: 137 sections x $140 = $19,180. That’s more than 11 times MORE (1,100%) than the cost of ArCHspec™. And those other systems are NOT oriented to residential architecture, and their paragraphs aren’t numbered and there aren’t any graphics included, and there’s no color coding and no Code references. Starting to get the picture why ArCHspec™ is better? And a better bargain? For the asking price, ArCHspec™ is an amazing value. ArCHspec™ includes approximately (and presently) 17+ 24″x36″ formatted sheets of architectural residential specifications, in 10 point Arial text. Each sheet has been estimated to contain roughly 7 pages of 8-1/2″ x 11″ text. This results in roughly (119) 8-1/2″ x 11″ sheets of text. And, as can be seen in the paragraphs below, there are 18 Divisions with a total of about 137 sections (this number is constantly changing, usually there will be more in the future). That’s a lot of information, however, when compared to other specification systems; a miracle of compaction. Architects designing homes may not (probably won’t) always use all of these sections, and they may include/create others. ArCH is continuing to work on bringing more sections to the product over time (about twice this amount of data is in the works and will be brought into future editions). So: users are paying not only for volume, but the intelligence of compaction included in the “design” of the information, that results in it being more condensed than traditional verbose specifications. Architects may find that, for instance, with a kitchen, laundry and pantry renovation project, they may need about 4 sheets of specifications. However, for a 4,600 HSF (Heated Square Foot) custom new residence, all 11 to 17 sheets may be necessary. And for a 4 story castle, with many more systems, more will likely be required. It really depends on what the Architect has included in the design. You are paying not only for quantity, but quality of information for custom residential projects. ArCHspec™ was first created inside AutoCADLT2015 (which was based on 2013 LT code). It is presently an AutoCADLT2017-18 data file. However, you may want to copy & paste the text from ArCHspec™ into programs compatible with AutoCAD2017-18LT (however, there is no need to do so: ArCHspec™ is fully functional inside AutoCAD2017-18LT and ArCH recommends that as the native environment in which you use it). This probably means that if you happen to have any of those current or previous versions, that ArCHspec™ should be able to open and function within them. ArCH has successfully copied and pasted text from ArCHspec™ AutoCAD2015-2017LT into MS Word (2013). Users may possibly also copy & paste into or other programs compatible with AutoCAD2013-2018LT, for single firm use on projects. ArCH cannot vouch for functionality in any other software but AutoCADLT2013-2018. Buyers are welcome to experiment. Update: Don Duffy Architecture in Charlotte, NC reported being able to open the ArCHspec™ file from inside ArchiCad (PC version 18) with full functionality. CMB Architecture in Denver, reports being able to copy and paste ArCHspec™ sections with Revit. Revit can be touchy about working with previous versions, however, both Revit and AutoCAD are made by AutoDesk, which leads us to believe that there are some compatibilities. The full extent of these is at present unknown. Look for future updates. Update: Bennett Sabatier, ArCH, Architect in Lafayette, Louisiana, recently successfully downloaded ArCHspec™ and was able to open it from within Vectorworks on a Mac computer. He stated: “Came in great. A small issue with the font substitution and word wrap functions in Vectorworks, but nothing that can’t be fixed easily in the process of review and editing the document for my own use…” Note that Bennett is using a Mac and that he will have to reformat the specifications for his Apple-based software. Such matters are beyond ArCH’s control; each buyer of ArCHspec™ will have to accept responsibility for such issues when using a Mac computer/OS/software. 2. Install that on your Mac. 3. Download the free ArCHspec™ abbreviated test file (above, closer to the top of this webpage above, at paragraph 600). 4. Start AutoCADLT for the Mac on your Mac. 5. While in AutoCADLT for the Mac, open the free ArCHspec™ Abbreviated Test file. 6. The ArCHspec™ test file, while only having about 7% of the specification content of full ArCHspec™, should allow you to see and zoom around the file and see if the formatting looks correct and if the thumbnail details provided look proper. You should be able to zoom in and out and see the overall product, the instructions, and the smallest detail in perfect resolution and with the text formatting intact, as it was created in AutoCADLT2016. 7. Make a conclusion: did it work on your computer? If not, then ArCH and AutoDesk probably won’t have any more suggestions. However, AutoDesk believes that the above process WILL work. After all, AutoDesk makes AutoCADLT. They should know if their products should be able to open a DWG file created in one version for the other. 8. Buy the latest version of AutoCADLT for the Mac from your AutoDesk reseller. 9. Load the non-trial, permanent version of AutoCADLT for the Mac on your Mac. 12. Open up your new, full version of AutoCADLT for the Mac. 13. From within AutoCADLT for the Mac, find the new, master PC file of ArCHspec™ on your computer and open it. 14. You should now have full functionality of the entire ArCHspec™ file. ArCH suggests that each time you use the file that you rename the file by updating to the current date (so that you know when you last updated it by your own hand), then make a triple backup, just to make sure that you have multiple copies. That way, your chances of losing work are minimal. 16. At this point, your computer is now running AutoCAD for the Mac and you have used that software to convert the native PC-based ArCHspec™ DWG file to whatever version works for AutoCADLT on a Mac. Enjoy and use! Start editing ArCHspec™ for your projects! 17. ArCH makes no claims that the above process will work. An AutoDesk reseller informed ArCH that the above process May work. Test it and see if it works for your system. ArCH will not be able to assist you in any migration process; that’s why there are test files, so that YOU can discover if the process will function properly for your computer and your software. 18. ArCH is Not affiliated with AutoDesk in anyway and is Not an AutoDesk product reseller and makes no claims as to any software’s functionality. ArCHspec™ is not MS Word or any other kind of word processing file. It is a file created in AutoCAD. Whatever functionality AutoCAD possesses, ArCHspec™ will enjoy. Also, whatever limitations AutoCAD has, is inherited by ArCHspec™. For instance: each specification is composed of separate sections (or “chunks”) of text. These sections are not linked through any type of word-processing to any other. ArCHmembers have found it easier to be able to manipulate the various Sections and paragraphs by simply dragging and dropping them, rather than dealing with other methods. Conversely, do Not expect for ArCHspec™ to automatically run over onto other pages as you add text. You will need to move each Section (and many of the paragraphs inside each section) to wherever you want them, as you edit them. Nearly every day, every week, or every month, something new strikes one of ArCH’s practicing Architects as something that should be in ArCHspec™. What to do? Answer: put it in there! Things that you might have thought should have been there from the beginning. That’s just one of the reason ArCHspec™ keeps getting tighter and tighter, every month and every year. And why there’s nothing like it, anywhere on Earth. It’s like there’s practicing Architects helping you improve your specifications on a nearly daily basis. If you ever want an update within the first year, simply ask. And within the first 3 years, for a reduced price and after that, for a reasonable discount. 01800 HEALTHY BUILDING SPECIFICATION (Base Bid)(note: among other common sense requirements, this also contains a provision that requires the GC to test for Radon). SPECIFICATION ITEMS (Optional) (among other features, this allows adding non-mold producing building materials, adding a radon removal system, electrostatic dust removal from the air stream and other healthy items). There have also been several, fencing and gate sections added in this area, from Chain Link to Custom Architectural Fencing and Gates. (Note: also includes excellent section on Encapsulated Unvented Crawlspace, including Code sections that allow this). (Note: this can help prevent roof leaks in your project roofing before they start. Start specifying a better quality underlayment for your projects). (Note: this section contains many graphic details indicating how flashings can be installed ). Each buyer is welcome to add more Sections. 15400 PLUMBING (in addition to normal residential plumbing, this includes option for Whole House Water Filter System and many other sections, such as a tankless HWH (Hot Water Heater) schedule with GPM, number of units and locations. 15500 FIRE SPRINKLER SYSTEM (this has now been updated to be its own Division). Are there are a few sections that your firm is used to using that are not there? That’s part of the beauty of ArCHspec™: delete or add whatever you want! Easy to do. Over time, each firm will make it their own, as they continue to edit the specifications over the years. Architects may be thinking: “Gosh; I don’t want to have a 1,000 page book of specs for my medium-sized house project.” And you won’t. ArCHspec™ is a masterpiece of compaction, with only the meat & potatoes of what is necessary. Architects can create a specification for a highly detailed Kitchen, Laundry, Pantry & home Bar renovation project with about (4) 24″ x36″ drawing sheets worth of specifications. That’s the equivalent of between 20 to 25 8-1/2″ x 11″ word-processed pages. Or a custom 3,000 to 4,500 HSF (Heated Square Feet) new home in about 10 to 14 sheets. That’s the equivalent of between 70 to 98 8-1/2″ x 11″ word-processed pages. That’s really not so much, when you think about the thick books many commercial architectural firms create for schools, hospitals, museums, office buildings and other similar facilities (often 1,000 to 2,000 8-1/2″ x 11″ word processed pages). And each Architect controls how long their specification is for each project. Most Architects don’t really enjoy preparing specifications. Not the big glamor job like design. However, having excellent residential specifications can save Architects, their Clients, Contractors and the projects themselves untold grief. Architectural residential specifications, properly prepared, can efficiently describe the WHAT and even the HOW and also the WHERE of most of the components, systems, coatings, procedures and other aspects of a project. While perhaps not the most “fun” task in an Architect’s office, preparing specifications can save the project from substantial problems. Having the specifications declare what is supposed to be used in the project eliminates confusion, misunderstandings, and possible change orders. If the specs say it, then that’s what is required. Specifications are very important. Now then, ArCHspec™ can actually be engrossing, satisfying and dare we say “fun”? because ArCHspec™ has eliminated much of the drudgery of editing specs. 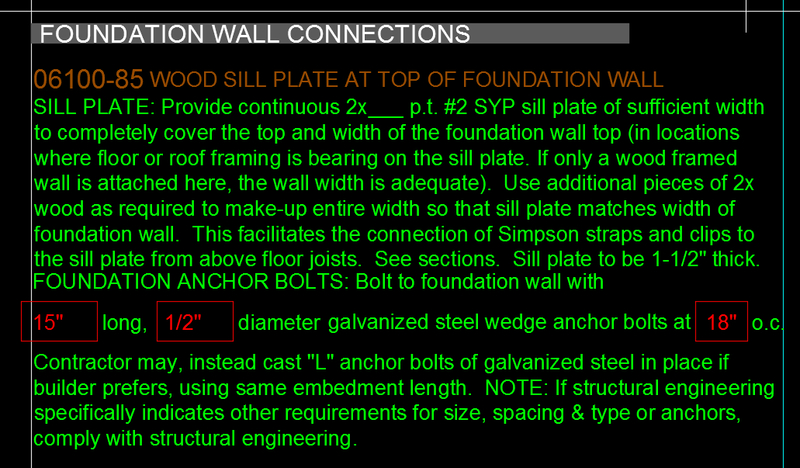 The point is: once you have the Green Text set, the time spent preparing and editing architectural residential specifications should plummet to a fraction of the time spent on it now. Being able to do a full 18 division specification in just a few hours rather than multiple days or weeks, can make all the difference in the life of an Architect, helping them to become more efficient and to have a more enjoyable workflow. How long each Architect spends depends on their projects and what they have to coordinate and their skill level with specifications, but the potential is there to not only have more coordinated specifications, but to also produce them in less time. That’s got to improve a company’s practice. ArCHspec™ initial release was focused on a Value-Engineered selection of products and materials. However, there are also some mid-grade and some higher-end items included. There are quite a few mid-grade to higher-end items presently being developed for ArCHspec™, so that in the future, there will be a choice of “Good”, “Better” and “Best” options for some Sections. This is, at present not yet available and is under development. In the interim period, each ArCHspec™ User is welcome to edit whatever Sections they wish to better reflect each firm’s practice. No single firm should expect to find ArCHspec™ with all or possibly even a majority of products and materials precisely reflecting a specific firm’s choices. This would be impossible to craft, and would result in a boilerplate of unimaginable size. Therefore, ArCHspec™ often errs on the side of VE (Value-Engineered) choices. Why: because VE is hard to do. Nearly all Architects have, from time to time, been put on the spot by a Client or Contractor who claims that the Architect has “Gold-Plated” the project. Rather than face such allegations, ArCHspec™ has in fact, used many of the materials and systems proposed by residential Contractors over the decades (the most durable types, in ArCHspec’s opinion) that still have architectural character. In this manner, ArCHspec™ has already accomplished much of the VE work for each Architect, when faced with higher than desired prices on Bid Day. It is far easier to add more expensive items to ArCHspec™ residential specifications, and each firm is welcome to do whatever works for them and their clientele. It is necessary for each firm to first completely review all of the ArCHspec™ edition they buy, and edit it to best reflect their office standards. This will be a big job and a necessary one. However, once accomplished, each firm should then have much of the specification on auto-pilot and be able to proceed in the future more swiftly. The more each firm accepts ArCHspec’s default choices for the Base Bid pricing, the less they will need to alter ArCHspec™. So, each firm might want to carefully review the Owner Optional Upgrade Section on the first sheet of specifications and consider making this their repository of upgrades, rather than radically altering the already economical choices built into ArCHspec™. 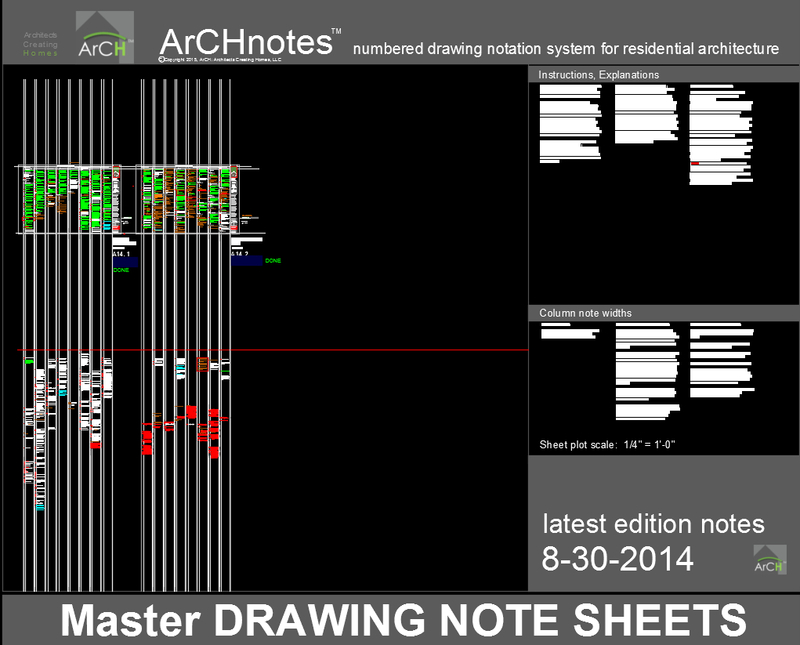 ArCHnotes™ are the easy to use LINK BETWEEN YOUR DRAWINGS AND YOUR NOTES & SPECIFICATIONS. 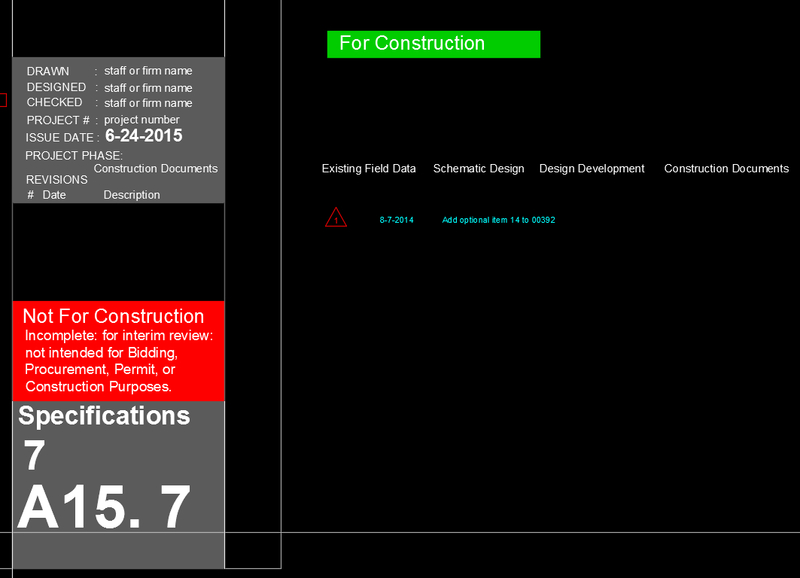 For a limited time, you will receive the ArCHnotes system on the same AutoCAD file as ArCHspec! Architects can use AutoCAD to edit the red notes to be whatever is desired, in each note Division, then copy and paste those onto your drawings. Also, the brown SpecNotes™ (associated with ArCHspec™) indicate what specification paragraph that note relates to, for use on your ArCHnotes™ and directly on your drawings, making it crystal clear what the Contractor is to use and where. Direct link back to the specifications! Note: the brown colored notes will print bold dithered with black & white printers, and brown bold on color printers & plotters. The red “organic” notes print in black. This allows Architects to have as much verbiage as desired for the note, but have only a brief note number on your drawing (which can also be amplified with a few simple words, if desired), for cleaner, clearer drawings, unencumbered (without too much text on the drawings). Buy ArCHspec™ now and also receive the typical State Board of Architecture required notices: Not For Construction & For Construction, that all Architects are supposed to be using during the progress of their projects and at the completion of their work. These have been formatted to allow you to simply slide them into place. What could be easier? Never let your CDs out of your office without one or the other notice on them, as required by your State Board of Architecture. The NOT notice is in bright red; the FOR notice is in green. Know the status of your documents at a glance. Also included: the various project phases and revision triangle and typical revision note. Just copy, paste and edit. Or simply slide into place using Ortho command. The architectural residential specifications are mainly self-explanatory and there is an instruction section included right in the file for easy reference, while Architects are working. There are no tricky software procedures to follow. The specifications are written in AutoCADLT2015-2017. Many of the focused data entry sections that change for each project are in RED, so that you can easily understand what to do where. There are various AutoCAD index colors (most of which will printout in black) in ArCHspec™ DWG file that are explained in the file, in large type on the right side. It is suggested that Architects edit in accordance with those color codes, as it will help to understand what is ready for publishing and what remains to be done on each project. ArCHspec™ is presently formatted for use on 24″x36″ horizontal drawing sheets, in AutoCAD2013-2017LT. If any Architect’s title block column for CDs (Construction Documents) is different than that provided by ArCHspec™, that firm may need to do some reformatting of column widths, or reduce the number of spec columns on each sheet. If a buyer would prefer to have their specifications in a book, it will be up to that user to convert the AutoCAD ArCHspec™ file into an MS Word file for their use. ArCH has test copied some text from the ArCHspec™ file directly into MS Word (2013 MS Word) and it appeared to work. ArCH does not presently have an entire duplication of the entire ArCHspec™ available in any other format than AutoCAD2013-2017LT. Why: ArCH Architects have found that, in their individual practices, that if the specifications are separate from the drawings, that the likelihood of the specs being on the jobsite drops dramatically. Out of sight = out of mind. “What specs?” Also, it was found that it is far easier to have the specifications actually within the same, single, large DWG file, below the drawings, to cross reference the specs with the drawings and details and Numbered Notes, which refer to ArCHspec™ paragraph numbers. The result: better coordinated Working Drawings & Specifications. It is recommend that Architects consider this approach. The specifications and drawings to which they refer will be more cohesive. Each 24″x36″ contains the equivalent of about 7 sheets of 8-1/2″x11″ text. This means that 5 to 13+ 24×36 sheets will hold from about 35 to 95 regular 8-1/2 x 11 sheets of data. That’s a fairly compact system, especially for custom home projects. Which underscores the compact nature of ArCHspec™. Redundancy in previous 3-part specification systems from others has been eliminated. The Part 1 information is mainly managed in Division 1 Sections that indicate that ALL Divisions and Sections must comply with manufacturer’s written requirements for Delivery, Shipping, Handling, Storage and Installation. ArCHspec™ architectural residential compacted specs are a work of word-smithing art and information coordination, to provide the necessary information required to provide the materials and components Architects want and need in their projects, without unnecessary & verbose redundancy. The architectural residential specifications are in a single AutoCAD2017-18LT formatted DWG file. There is no other software fighting you as you attempt to edit the specs, as you might encounter from other organizations’ forms. If you know how to use AutoCAD’s text editing features, you should be able to edit the specs with little to no problem. AutoCAD is a computer drawing program that is created and sold and copyrighted by AutoDesk, Inc., which is an independent company. ArCH is in no way associated with AutoDesk. Users will need to purchase/own AutoCAD2013-2017-18LT (or beyond) to open the ArCHspec™ file. ArCHspec™ is a template file that “rides on top of” AutoCAD2017-18LT. If you do not have AutoCAD2013-201-187LT(or beyond), you will probably not be able to open ArCHspec™. There will be no refund for buyers assuming that ArCHspec™ will be operational without AutoCAD. See the Terms associated with all Arch purchases during check out, to which you must agree to complete the buying process. When you pay for this ArCHspec™ file, you will be simultaneously agreeing to this License, Merchantability statement and Liability/Disclaimer. YOU will be licensed to use it as many times as you wish, with no additional payments. This is with the understanding that you are an Architect and not a reseller and that you will not attempt to copy, sell, re-engineer, or give ArCHspec™ to anyone else, other than for your use on your projects. Know that there will be updates possibly yearly (or more or less often, as deemed appropriate by ArCH) and you will need to purchase the updated file, if you want the updated language. There will be future discounts for those who have previously purchased ArCHspec™, within a 3 year period. Beyond that, the discount will no longer be applied. You may Not provide copies of this file to others, either in printed form or electronically for others to use for projects other than your one firm’s projects. ArCH owns the copyright to this file and this copyright is not being sold. You are allowed to copy and paste ArCHspec™ into a word processing program (if you so desire, but that is not necessary), for YOUR use (and no one else’s) on your projects, as an Architect. You are allowed (and required) to modify your copy of ArCHspec™ to suit your projects, your practice and the location of your projects. You must modify ArCHspec™ in order to have it properly define the specifications for each of your projects. You are agreeing to NOT use it “as-is” “out of the box.” You are agreeing to modify ArCHspec™ as required to properly define your projects, and you are accepting complete responsibility to do so. By buying and using this ArCHspec™ file, you are holding ArCH: Architects Creating Homes, LLC (ArCH) and its officers, members, employees, founders and consultants harmless and you are indemnifying them against actions from you and others involved with your practice and your project(s) and you are agreeing to defend them from such actions. You understand that this form is not a valid set of specifications until you have a licensed Architect in the state of the project(s) review, edit and complete the specifications, to conform to the laws & requirements in the state of your office and that of your project location(s). You understand that this ArCHspec™ file must be revised to properly address each of your project needs. These revisions may include the moving of certain specification Sections, removing other Sections entirely, adding of new Sections that you and your firm create (as required to suit each project’s needs, that may not be presently in the ArCHspec™), and other changes as your licensed Architect and your legal counsel determine, to comply with the laws governing your practice where your practice and where your projects are located. ArCH is Not your Architect, not your consultant, nor your legal counsel and you hereby acknowledge this. There may be references in the ArCHspec™ that have not been updated, for instance: for a wood industry product item, or concrete ASTM number or other section reference. You hereby absolve ArCH from the accuracy of such references and understand that as the licensed Architect of each of your projects that you and your firm are responsible for the content of the documents that you publish, sign and seal, not ArCH. There are several small schematic details included in ArCHspec™. You hereby agree to edit those details when you use ArCHspec™ and you are agreeing to be completely responsible for their usage and content and arrangement in your documents. Should you, as a licensed Architect using ArCHspec™ find certain inaccuracies or non-updated references for product materials and the like, please make ArCH aware of such items so that ArCH can correct these for the future. Perfection is neither promised nor implied in the ArCHspec™ file. However, ArCH will appreciate updates from those among you who notice items that need attention. See the ArCH website CONTACT menu item and transmit any suggestions there. No merchantability or fitness of purpose is promised or guaranteed with your purchase of this ArCHspec™ specification system. However, you may find it more useful than other specifications that are not specifically addressing residential architecture. There is no promise made that there are not flaws in the specifications that Must be revised and updated by you and your company in order to avoid significant legal problems. This form is Not a valid set of specifications until an Architect licensed in the state of the project(s) reviews, revises and corrects the language so that it complies with the requirements for your project in the location (state) of your project. ArCH is not practicing architecture with the offer of this specification system. Only you, as a licensed Architect in the state of your projects can legally do that. ArCH is simply offering a form of specifications for sale that has been a good starting point for SFR (Single Family Residential) projects, that must be reviewed, revised, corrected,completed and edited by an Architect licensed in the state of each project. Do Not proceed to use these architectural residential specifications without a licensed Architect assigned to edit them. I’ve been writing specs and designing custom homes for over 40 years. I’ve been a Licensed Architect for the last 33 years. Of all the specification systems I’ve used over the decades, ArCHspec is the BEST. While it was conceived for residential projects, I must confess, I use it for some commercial jobs as well.